Firefrost glass jewellery is designed and handmade by us here in the UK. We use Murano Glass beads from Venice, Sterling Silver, Swarovski Crystals and occasionally other lovely beads when we come across something special. We love experimenting with new colours and styles. 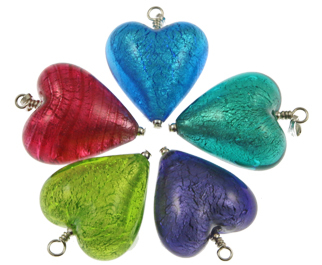 We set up Firefrost in 2006 after a visit to Venice where we were wowed by the fabulous colour and choice of Murano glass jewellery and beads in the shops. Firefrost is all about colour. We offer our jewellery designs in a range of up to 10 different colours. Because we make all our jewellery ourselves we are always able to make something longer or shorter or just slightly different to suit. Please contact us on 07827 870697 if you have any special requests. Please note, even if you don’t have a Paypal account you can still use your debit or credit card at our PayPal checkout. Click here to to read reviews from lots of our happy customers. We’ve been asked lots about our name. We chose the name ‘Firefrost’ to suggest the fiery colours of glass that our beads are made from and their lovely frosted silver lining. It also represents the fire in which the glass is made, the heat of Venice where we buy our beads and the cool crisp mornings of Cumbria where we make our jewellery. And we like it!